The day didn’t begin too well as it was raining and we couldn’t get onto the field for the first hour as we had to wait for a huge articulated lorry to be removed from the entrance. This meant that by the time we had set up the course we were a bit late starting, but at least by then the rain had stopped. In the beginners class, the chicanes proved a bit of a challenge for Christine with Mia and Pam with Grace, Yogi had a good round with Becca, but his strength meant that they lost a few marks for ease of control. John and Susie had an almost clear round – well done! The scores for Keith with Marti and Tim with Lottie were very close, the latter pair losing slightly more points on the obstacles. 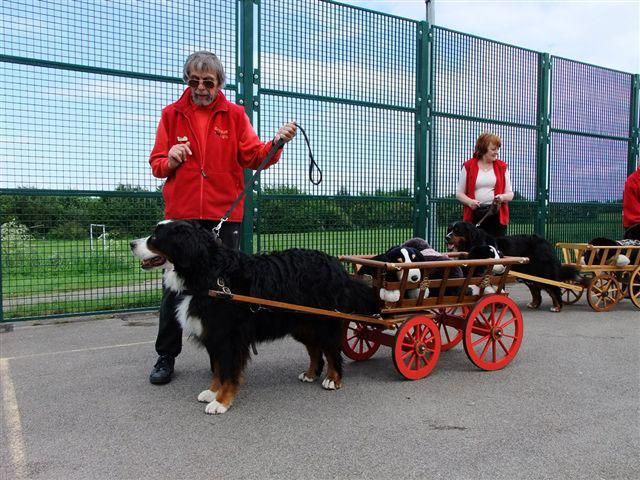 Bruce with Asti and Bruce with Dixie (his 10 year old Aussie) had superb rounds, very calm and controlled. Bruce also had a really good round with Bear, his first time at Advanced Level (Bear that is – obviously!) it was such a shame that Bear did not want to reverse! Definitely one to watch once he has mastered this. Tim with Tilly also went well, as did Pete with Cimo; problems with the kerbs knocking them into 4th place. Keith and Hetty also did well, the second chicane losing them several points. It was an enjoyable day for me as judge, it was really good to see how highly everyone scored on ease of control; the big dogs, especially, Cimo and Bear, have come on really well and were clearly listening to their handlers. One point to note for the future is to remember not to touch the dog during the obstacle even to give praise.